Doesn’t it feel great when we finish (or at least finish the quilt top) a project? I first started working on reproduction quilts with some great reproduction fabrics in early 2014 with Barbara Brackman’s BOM, Threads of Memory. The blocks were completed sometime last year (early 2015) but were put in the UFO stack and I moved on to other projects. The original pattern had flying geese surrounding each block, I was “too lazy” do to all that work, so the project just sat there a little longer gathering dust in the UFO bin! It felt so rewarding to complete the Belle of the Ball Ladies quilt last week that I had decided to continue on with “catching up” with UFO’s. I really liked the effect that the sashings had on that quilt and decided to continue on with the same type of sashings for Threads of Memory! Although I am not completely finished, I wanted to post a picture of the blocks sewn together. The next border will be the dark crackle brown and a light crackle border. I am pleased with this quilt. I have also been SLOWLY working on the May block for Ms Potts BAS project. I changed the block to some EPP flowers and used batiks. I am hoping that this block will allow me to mix and match some fabrics and incorporate more colors into the quilt. Of course, you can see that the next step is to Applique the flowers to the background and then I will be through with the block. I just love the colors. I can barely hear my CWB project, block 4 calling in the distant background and hope to start on it soon. I also have one more quilt top to put together, but need to decide if I am really going to like the quilt. The blocks are 16″ house blocks. 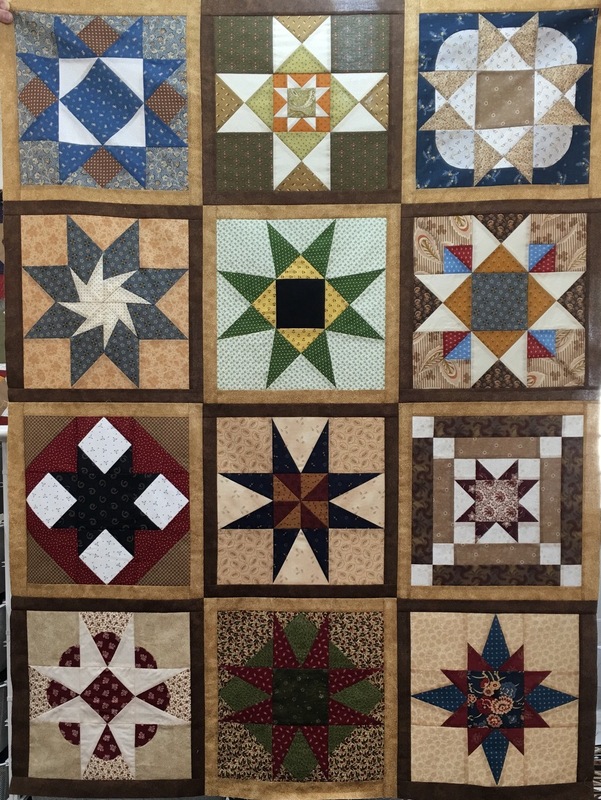 I had a lot of issues with the pattern and the colors are not really my favorite, so I f I decide that I do not want to put anymore effort in the project, I have the perfect Quilter’s home to send it to for completion. Have a great week and keep on stitching – it pays to work the UFO Bin every now and then for that great feeling of accomplishment! This entry was posted in Quilting and tagged Ms Potts, Threads of Memory Quilt. Bookmark the permalink. Yes I think so and the are not holding up well after 1 use. I love batiks and this one gives the little petals a great look. I need to mark some of my EPP pieces if I purchased for a specific quilt! Nice work getting those Threads of Memory blocks together. Your solution looks great! Mine are still waiting in a box. Thx Jeanne. I did not intend this quilt to beentered in a show so now it will keep me warm this winter! Oh, DOES it feel good to complete UFOs? I wouldn’t know, it’s been so long since I’ve finished anything!! 🙂 I really like how the color of your coping strips alternates from block to block in Threads of Memory. It gives a neat effect of some blocks coming forward and others receding. I’ll have to tuck that one away in the back of my brain somewhere! Your batik hexies are darling, too. Well, I only have one more top to put together, but it will be a show quilt so that takes more time. The house quilt has found a new home so I am now pretty well caught up with all. Now to get with the long arm program and get some of these quilts really completed. Thx for the comment. I like the effect of the dark sashing/light sashing around the Threads of Memory blocks. I made a couple blocks but just didn’t have time to spend on keeping up with the blocks. May do it yet. Like you, if a quilt project is not really coming together the way I would like to see it or I have changed my mind about the colors, I do not hesitate to pass the parts on to another quilter that is thrilled with the project and willing to finish it.